With the insurance company he founded linked to Chicago crooks and his own job gone, Springfield financier H.B. Hill tried make his suicide look like a gangland murder. Hill shot himself in the head sometime on the afternoon of Dec. 1, 1934. His body was found behind the wheel of his bullet-riddled car, which was parked on the Beardstown Road just west of Springfield (the site today is near the intersection of Jefferson Street and Veterans Parkway). 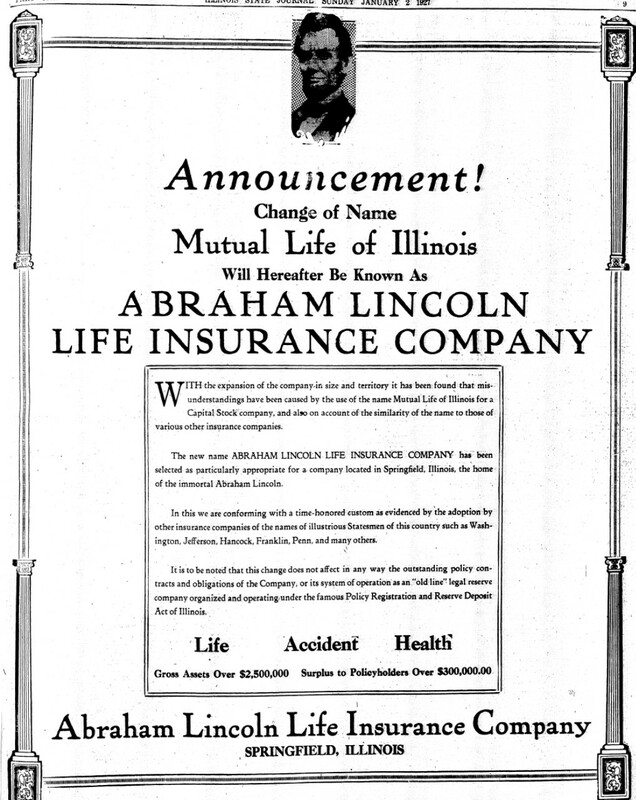 A popular early theory was that Hill had been murdered as the result of the under-the-table sale of Springfield-based Abraham Lincoln Life Insurance Co., which Hill controlled. The buyers were a group of Chicago swindlers who planned to plunder the company’s cash reserves, according to authorities in both Cook and Sangamon counties. The Illinois Insurance Department quickly reversed the deal. Instead, Abraham Lincoln Life was in the process of being sold to a reputable Monmouth company when Hill died. However, Hill still faced questions about a $900 check he had received from the unsavory Chicago group. Hill had told Sangamon County State’s Attorney Alfred Greening the money was a loan to tide him over until that sale settled. He had believed the Chicago buyers were legitimate, Greening said Hill told him. Some investigators were convinced Hill had been murdered to keep him from answering questions about the sale, the Illinois State Journal said. The theory that Hill was murdered is based on the fact that he was in the possession of all the facts of the recent efforts of Chicago crooks to secure control of the Abraham Lincoln Life Insurance company, through its transfer to Gustaf Lindquist, who is now missing. Despite Hill’s elaborate murder scenario, authorities quickly figured out he had shot himself, apparently out of embarrassment at the loss of his company and the scandal swirling around the sale. Harmey “H.B.” Hill (1882-1934) was born in Missouri and went into banking and then insurance in Quincy, Ill. He moved to Springfield in 1911 and founded the Commercial Health and Accident insurance company in 1914. The company underwent several name changes and at least two office moves over the next 20 years. Hill was active in a variety of local civic organizations. A Democrat, he was briefly discussed as a possible candidate for the Illinois Senate in early 1934. 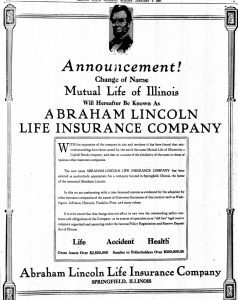 Hill’s firm was known as Mutual Life of Illinois in 1925, when, at his initiative, the company became the prime financier behind construction of Springfield’s queen of hostelries, the Hotel Abraham Lincoln. The hotel was built on the former site of Mutual Life’s headquarters, and Hill served as president of the hotel company. At the time of Hill’s death, however, dividends from the hotel investment were already three years in arrears. They would never resume. Whether that bad bet played any role in the sale of Abraham Lincoln Life is not clear. Hill and his co-owners, however, apparently were desperate to unload the company, and they didn’t seem to care if the buyers were shady. The Chicago syndicate’s bid, in fact, was the second time in a few months that Abraham Lincoln Life was temporarily sold to investors eager to vacuum up its cash. State insurance officials also had to step in during the summer of 1934, after a Kansas City syndicate bought out Hill and immediately began to issue suspect checks to insiders. That time, the state returned Abraham Lincoln Life to local control and ordered Hill to file suit to recover $13,000 in allegedly misspent funds. Regulators also demanded that Hill notify them in advance if he proposed to sell the company again. Hill violated that order when, again with no notice, sold Abraham Lincoln Life to the Chicago group, state officials said. This time, after booting the Chicago buyers, the state arranged for the company to go to Illinois Bankers Insurance of Monmouth. Hill remained a stockholder until that sale finalized, but the deal meant he had to step down as company president. According to a later reconstruction, on Friday, Nov. 30, Hill visited Greening to explain the circumstances of the $900 check. He then went to his old office in Abraham Lincoln Life’s building at Spring and Monroe streets, according to Journal coverage. He was no longer welcome there. The new president, Ralph W. Turnbull, had already told him that he was no longer wanted. There was no salary awaiting him, the insurance department having issued instructions to drop him from the pay roll. On Saturday, Dec. 1, Hill had lunch with his mother and told family members he planned to drive to a farm he owned near Ashland. Instead, Hill went to a Beardstown hardware store, where, using a false name, he bought a .32 caliber Harrington Richardson revolver and ammunition. After that, he stopped at another hardware store in Virginia and bought a file, the Journal reported. Authorities believe that Hill then went to some secluded spot, filed the (serial) numbers from the revolver and fired the shots into his car, then drove to the point on the Beardstown road near Spring creek and ended his life. At least six bullets were shot into the car from outside, police said, although they were able to find only three slugs. Hill was killed by a bullet fired into his right temple. Another bullet, perhaps fired to make the fake murder look better, grazed his neck. The gun was found in Hill’s right hand, but was held only loosely, leading to early speculation that it had been placed there by the purported murderer. Hill’s plot came apart after clerks at both hardware stores identified Hill as their customer, and firearms experts were able to recover the filed-off serial number, proving Hill had bought the gun. They also confirmed that two .32 caliber slugs shot into Hill’s car from outside came from the weapon Hill had bought. A coroner’s inquest delivered a verdict of suicide. Hill’s motive for the elaborate fake murder was never totally cleared up. His life insurance policies – as an insurance man, Hill carried $135,000 of coverage on himself, substantial for the time – were to pay off even if he committed suicide. Greening offered the most convincing theory. This entry was posted in Business, Crime and vice, Law enforcement, Prominent figures. Bookmark the permalink.